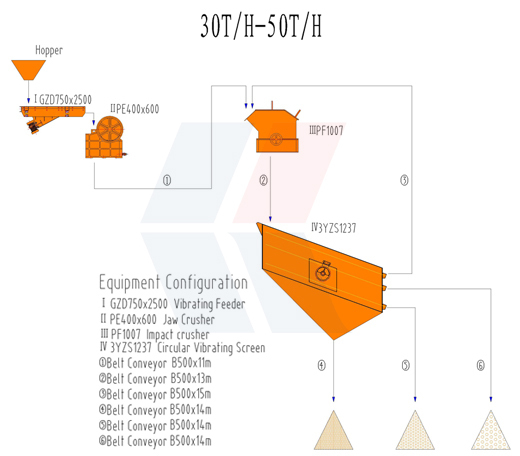 The Stone Crushing Plant 30-50T of our company mainly consists of Vibrating Feeder, Jaw Crusher, Cone Crusher or Impact Crusher, Vibrating Screen, Belt Conveyors and Control System, etc. It is completely capable to crush and screen limestone, marble, granite, basalt, river stone and so on, and produce sand & gravels with various granularities for construction and building industry. We are able to design and manufacture complete crusher plants with capacity from 30tph to 500tph, and to provide optimum and most economical solutions according to customers’ requirements on stone specifications, capacity, application, etc. 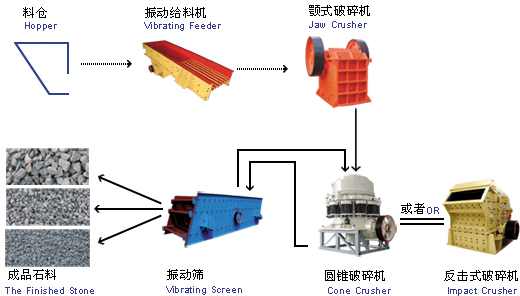 Large stone materials from the hopper are evenly and continuously fed into jaw crusher through vibrating feeder for primary crushing; the crushed materials are transported to cone crusher or impact crusher for fine crushing through belt conveyor; then the materials are transported to vibrating screen to be separated into different sizes. The end products with desired sizes will be transported to the final product pile and those with big sizes will return to the cone crusher or impact crusher for re-crushing. This forms closed and continuously automatic cycles. The plant can be equipped with dust removing facilities to protect environment according to customers' requests. 1.High degree of automatic operation; the entire production line requires almost no manual operation except for machine starting and stopping, routine maintenance. 2. High productivity, low investment, and good appreciation. 3. Regular end product granularity, good grain shape, and low powder output. 4. Adopting high advanced control system to ensure security and reliable operation of the entire production line.